Trafalgar Wharf: How much money can you save by joining Boat Club Trafalgar? How much money can you save by joining Boat Club Trafalgar? Let us show you how spending £8,600 on a boating membership can get you a whole lot more than spending £16,503 a year and getting lumbered with 'the same old thing' every weekend! Ever since we launched Boat Club Trafalgar, people have been asking us to 'Show Them The Money'. They know they want to get into boating, but they are not sure exactly of the best way to finance it. So rather than having the same conversation again and again, we have done some research into what it costs to run a boat, versus, being a member of Boat Club Trafalgar. We compared the costs of owning a new 7-8m boat financed over 3 years against being a Platinum Member of Boat Club Trafalgar for the same period of time. If after 3 years the boat was to be sold, taking into account depreciation there would be an estimated return of £43,780, making the cost of boat ownership over 3 years £49,509. It’s an incredible saving of more than £23,000. That’s nearly HALF! Now you know why people are making the decision to go with Boat Club Trafalgar. It’s because there actually is a way of 'having your cake and eating it' when it comes to boating. When you’re paying almost £18,000 just to store and maintain a boat over three years it’s got to be a serious consideration to buy our Platinum Membership instead. And Boat Club Trafalgar works out massively cheaper than boat ownership when you take depreciation into account. So that’s the finance side taken care of. A Whole Fleet To Choose From – For A Little More Than Annual Boat Storage. With Boat Club Trafalgar, you are able to enjoy our range of premium, new RIBs and powerboats, without committing to owning just one boat. Come and try out some of our Finnmasters and Ballistics to see why our members rave about them. All you have to do is turn up and go. No worries about insurance, safety equipment, maintenance or storage or launching. Plus you get a free RYA Powerboat Level II course included with your membership and all the other training you need to enjoy the boats and the Solent. Our location gives you unbeatable access to the Solent and the surrounding areas, with the site situated just minutes off the M27. The location of Boat Club Trafalgar makes day trips across to Cowes an accessible and feasible option for those living in London. Our great location at the top of Portsmouth Harbour allows you to be in the Solent within 20 minutes of leaving our pontoon here at Trafalgar Wharf, allowing you to dash across to the Isle of Wight for lunch in less than an hour. It’s easy to book out a boat from our fleet with our online app – just book it in, turn up and off you go. 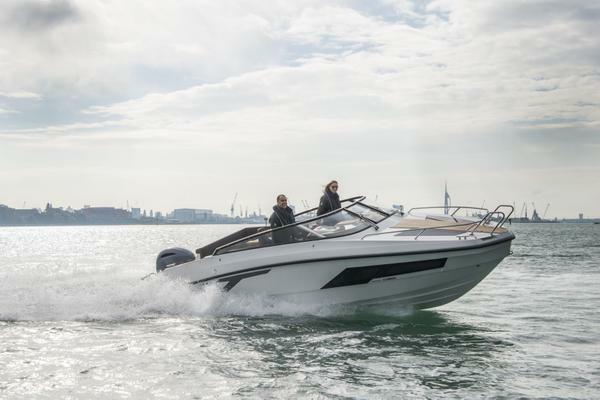 We will have the boat you have chosen in the water, fully fuelled and ready for when you arrive – saving you time and giving you a hassle-free and enjoyable day out on the water. Our range of boats and membership packages are flexible and adaptable to any occasion allowing Boat Club Trafalgar to fit perfectly into busy lifestyles. Call us now on 02392 706599 to find out more about Boat Club Trafalgar and what we can offer you. PSST! There is a special offer for Founder Members – Call us now to find out more about this unmissable deal!